2) As always, the multifaceted levels of cultural production @furtherfield signal to those "in the know" that, curatorially speaking, they are the 21st century version of Pound's "antennae" picking up transmissions before most of us can even make a connection ("Artists are the antennae of the race, but the bullet-headed many will never learn to trust their great artists."). 3) The London Executive Director of Arts Council England agrees with that sentence above but addresses it more formally by writing, "Digital technologies have become a fundamental part of modern life and artists are at the forefront of interrogating what this means for their work and broader society ... Furtherfield has been a pioneer of this emerging practice ..."
4) The opening exhibition theme of "Being Social" is a further indication that net art per se was always less about "being digital" than about "being [inter]connected" -- and that personally expressing yourself through the social media network is an evolving form of performance art & remixological practice driven by the circulation of conceptual personae in the networked field of distribution. Distributing your conceptual personae through the social media field of action is what Karen Eliot and Luther Blissett are are particularly good at. So it's no wonder that their offspring, on exhibit here as Karen Blissett, would be spawned by Web 2.0 media platforms. The multiple Karens who reconfigure themselves into a simultaneous and continuous fusion of personae-as-shareware projects present themselves as a marvelous art-making machine. Everything-they-do-now is a manyfesto of aesthetic différance. 5) "Internet-aware art" is already an outmoded term. Contemporary art is always already Internet-aware. Now the question is: can contemporary art lose its self-awareness as art per se while charging the language of new media to the utmost possible degree? 7) We really need to develop more experimental / multimedia / theoretical formats that can "read" and/or interact with (expand upon) the emerging forms of vernacular video that are now fully embedded in social media culture. We need to do this in terms [i.e. in remixological styles] that will propel everything-we-are-doing-now into a higher rhetorical framework. 8) In some ways, the most interesting contemporary artists are already propelling these changes forward just by doing-what-they-do-now (cf. Ryan Trecartin, Michelle Ellsworth, Stanya Kahn, or Oliver Laric). 9) The duo Thomson and Craighead, whose "London Wall" is on exhibit at "Being Social," are perfect examples of how "early net artists" can not only maintain relevance and build their oeuvres for the duration, but can also mature into important artists-as-artists in their own right minus the marginalizing labels (to repeat: we can now drop the "net" part, and yes, the "Internet-aware" flava too -- that phase is officially over. If you identify yourself as a contemporary artist but are not Internet-aware or at the very least network-influenced in your thinking about what it means to actually be an artist today, then you are not contemporary). 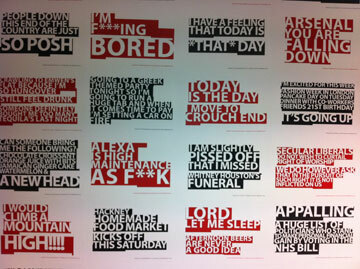 The source material for these wall texts is generated using locative technologies that identify tweets being uploaded from around the Finsbury Park area. Apparently, some of the random tweeters have since found their way to the gallery to have their own image taken with the art work. * upon further(field) reflection, it does not really matter how self-aware contemporary art is of its status as art per se, whether Internet-dramatic, -refined, or -exclusive. If one is engaged with their social media art practice as a simultaneous and continuous fusion of remixological performances that take place in unrealtime, then all you need is love. Love, after all, is what fuels the collaborative composition of "Being Social" and, yes, that's a political statement. So is this show.